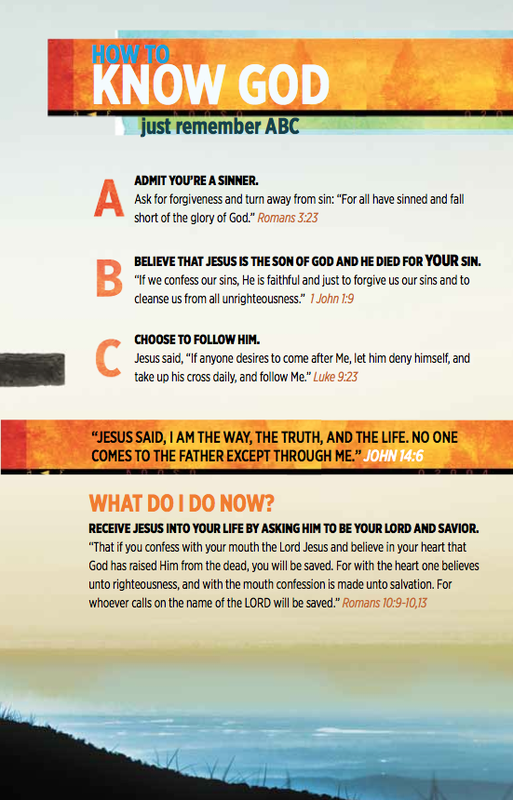 Near the middle of the KiDs Beach Club® Explorer’s Study Bible, is an inset page about “How to Know God.” It’s on glossy paper and is full of color and is designed to be an attention getter for children and their parents when they read the Bible. It reinforces what is already taught in Beach Club. So his small group leader went through each letter explaining what each one is making sure he understood. The boy prayed with his leader that day to receive Christ. About a week later, the club leader called to follow up with the child’s mother. She immediately told a story about how he has brought his Bible to the dinner table every night. He would read through the Gospel with his family and pray before they could start dinner. The boy’s mother said she thought he had such a mature understanding at such a young age. The mother admitted that she had not really had these kinds of conversations with her kids before. She also has two older girls, including one in college, and they had not really had spiritual conversations as a family. That changed because of her young son. Praise God! Your support of our Bibles for Beach Club program helped put a Bible in this child’s hands and that helped connect him to Christ. It also opened a dialogue in his family so that they, too, might come to know the Lord.